Language is a very important part of life. Communication between people not only enables us to understand one-another, but aids in developing relationships and allows us to communicate our problems, suggestions and plans. I’m sure you can all agree that language is a crucial part of everyday life. But how did we learn to speak? How do we know what to say and when to say certain things? Language Acquisition is something that can often be misunderstood, simplified, or even forgotten. Yet from the word GO, acquiring language and using language is an amazing ability we, as human-beings, have. Babbling – The experimentation of sounds by an infant, tending to include recognisable words. Phonemes – Small segments of sound. Subject literature provides guidelines for the average age specific language features are acquired – but different authors cite different milestone dates, depending on where they conducted their research. 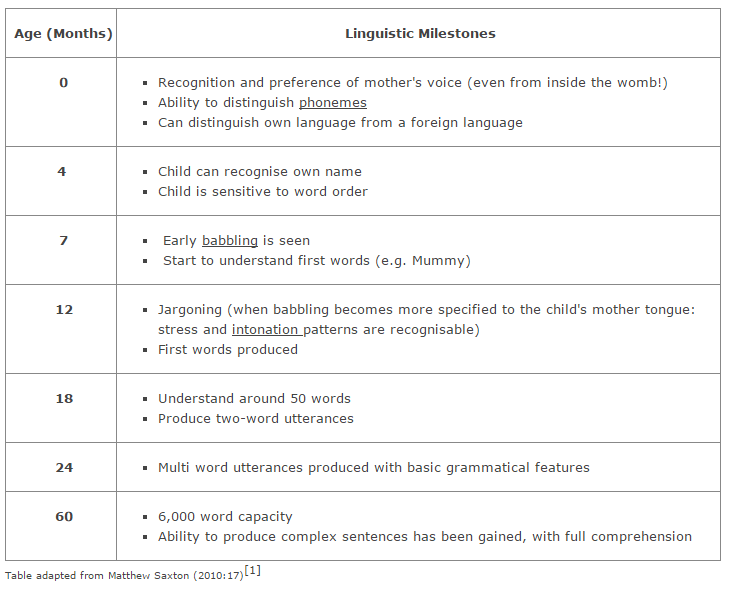 So it’s important to note that dates, in terms of specific linguistic milestones, are not concrete and can vary slightly from child to child (see Language Acquisition in Exceptional Circumstances for more information). In order to speak a language as adults do, children need to have acquired five areas of linguistic competence: Phonology, Lexis, Semantics, Grammar and Pragmatics. Phonological development is the acquisition of sounds in order to pronounce words. Child Language Acquisition begins at birth. The inner ear has the only bones in the whole body which are fully formed at birth, thus enabling the child to start recognising their mother’s voice in the first day of living and also allowing the child to differentiate one language from another at such an early stage. The vocal tract is not fully developed at birth which, when compared to the formation of the inner ear, helps to biologically explain why it is that perception of sounds comes before the ability to produce sounds. Through ‘vocal playing’ (highlighted in the 5 pre-verbal stages below) children learn to control their vocal tract to produce sounds accurately (REMEMBER: Each child differs, so the dates provided are a guideline). Basic Biological Noises (approximately 0-8 weeks) – Vocalisations: coughing, crying, a low cooing, laughing etc. 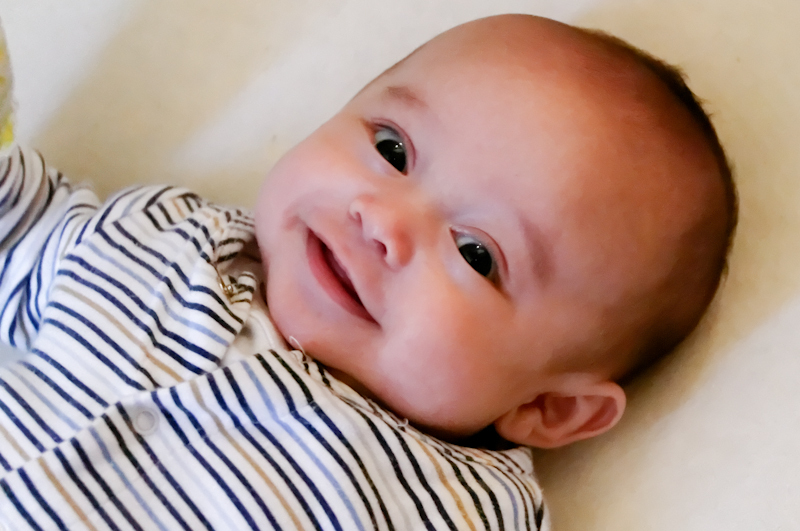 Cooing and Laughing (approximately 8-20 weeks) – Short vowel-like sounds produced when the baby is in a settled state: more melodic than biological noises. At three and a half months, a baby’s voice box is in place and gradual control of vocal muscles is gained. Vocal Play (approximately 20-30 weeks) – ‘Cooing’ sounds develop into sounds which are much more definite and controlled. Variegated babbling, for example [adu] and [maba], is when there is movement away from fixed patterns and sounds become more complex and closer to speech. Consonants and vowels can change from one syllable to the next. Melodic Utterance (approximately 36-72 weeks) -Intonation, rhythm and melody develop, resulting in babies sounding more and more as though they are speaking the language. The occasional few words may have started to appear. Parents start to assume different sounds resemble different linguistical structures, such as questioning, exclaiming and greeting etc. Babies of different nationalities sound increasingly different from each other. Lexical development is the acquisition of words. Naming things or people: ball, Daddy, juice, milk. Actions or events: down, more, up. Describing or modifying things: dirty, nice, pretty. Personal or social words: hi, bye-bye. Semantic development is the acquisition of the meaning of words. Children tend to use words more broadly than adults and over-extensions and under-extensions are found to be produced. Over Extensions – A child uses a word in a broad sense. For example, the word ‘dog’ may be used to refer to all four-legged animals with a tail. Over-extensions reflect a child’s learning and their growing knowledge of the world; noticing similarities and differences between objects. Under Extensions -A child uses a word more narrowly than an adult would. For example, using the word ‘shoe’ only when referring to their own shoes. These features of semantic development are crucial in gaining meaning and understanding of words. Eventually, children will overcome these features. There are three main stages of grammatical development. Children are more likely to retain CONTENT words (nouns, verbs and adjectives that refer to real things) and FUNCTION words (that have grammatical function: pronouns, prepositions and auxiliary verbs) are often omitted. Such examples would suggest that children try to figure out grammar by themselves, using grammatical rules productively to establish forms, not by hearing form from the people around them in their environment. Children would not hear such examples as ‘goed’ from the adults around them. Pragmatic development highlights children’s motivation to acquire language in the first place, as it serves different purposes and functions. Pragmatics aren’t acquired immediately, nor does it take a short period of time for a child to acquire them. This process is on-going until the age of approximately 10 years. If you are unsure of any of the terminology on this page you can revise your knowledge in our Glossary. Saxton, W. (2010). Child Language Acquisition and Development. London: SAGE Publications. Nelson, K. (1973). ‘Structure and Strategy in Learning to Talk’. Monographs of the Society for Research in Child Development. 149(1-2). 1-137. Halliday, M. A. K. (1975). Learning How To Mean. London: Edward Arnold Ltd.